The cover price is US$30.00. This book contains 122 pages. As part of a continuing study of the nature and causes of aerial shell malfunctions, it was useful to produce a detailed time sequence for the events occurring during the firing of typical (properly functioning) aerial shells. While it is recognized that few if any non-researchers will find much practical information in this article, it was written in the thought that such information might be of general interest to those wishing to better understand the shell firing process. The information used in preparing this time sequence of shell firing events comes from several sources, some of which has been published previously. The sources of information include normal and high frame rate video recording of aerial shell firings, mortar pressure profiles (internal mortar pressure as a function of time) during actual shell firings, and simple calculations based Newton’s second law of motion. Reprint Information: Number of pages = 3. .
An earlier article presented information about the magnitude of firework mortar recoil forces. As a starting point, that article used the averages of 136 measurements of the peak internal mortar pressure produced upon firing 3- to 12-inch spherical aerial shells. These peak pressures were then converted to recoil forces using basic principles of physics. However, while the average peak recoil force results are thought to be highly reliable for typical shells, those results were not confirmed by physical measurements of peak recoil forces. During the 1990s, the Canadian Explosives Research Laboratory (CERL) conducted a large number of measurements of firework mortar recoil forces. Some of the results from the testing of 205-, 255- and 305-millimeter (8-, 10-, and 12-inch) aerial shells have been published. Approximately half of these test shells were produced in the Orient and half were from Europe. The purpose of this short article is to compare the CERL results with the results the earlier article and to draw some conclusions from those comparisons. Reprint Information: Number of pages = 1. Download for free p 805. Recently, a supply of indoor (proximate audience) pyrotechnic items was supplied for our casual (non-quantitative) evaluation. The claim to fame for this product line is reputed to be its low smoke output and its high purity flame colors. 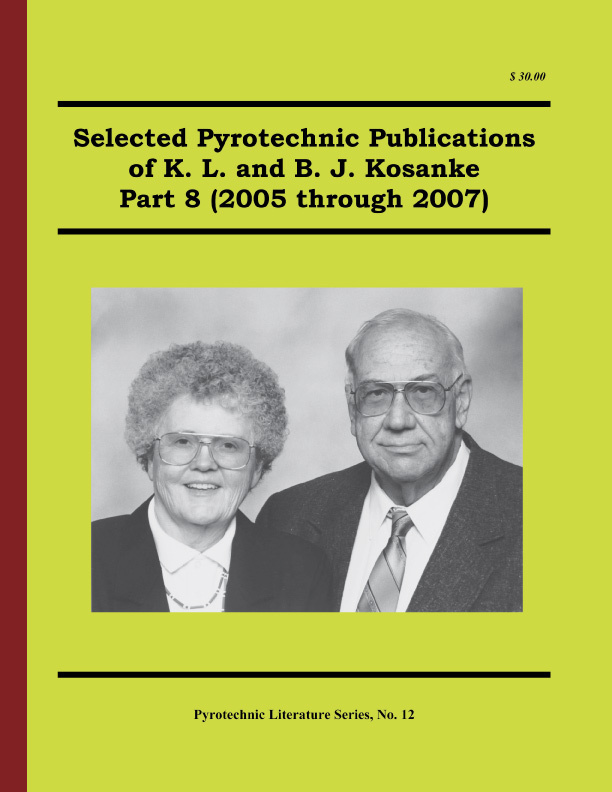 The principals of the company (DMD Systems, LLC) are some of the same researchers that previously developed and wrote about similarly performing pyrotechnics in the Journal of Pyrotechnics. We were willing to provide such a cursory evaluation (without cost) because of our general curiosity regarding these products. Reprint Information: Number of pages = 1. Download here for free. The stability and aging characteristics of Black Powder are occasional topics of discussion. Having been given a research sample of Black Powder that had been recovered from the explosive charge in cannon balls dating to the time of the US Civil War (ca. 1863), the author was able to investigate these issues for that powder sample. Reprint Information: Number of pages = 2. Download for free p 806. This article reports on another batch of comets, imported from China, that tend to malfunction by exploding violently within their mortars as they are being fired. In the last few years, the authors have reported on imported Chinese comets from two other manufacturers, with somewhat similar construction characteristics, that also tended to explode violently upon their firing. In each case, it was found that the malfunctioning white (or silver) comets had a high percentage of very fine magnalium (magnesium-aluminum alloy), used potassium perchlorate as the oxidizer, and had internal voids that could function as fire paths. The comets in question for this article are of two different types: 3-inch solid cylindrical comets, and 3-inch tiger tail comets made by layering comet composition over an internal aerial shell. While some cartons of both types of comets tended to experience the same explosive malfunctions, only the cylindrical comets were carefully studied and will be discussed in this article. Reprint Information: Number of pages = 5. Download for free pp 807-811. A study was conducted to determine the potential for being able to identify primer gunshot residue (PGSR) within the substantial quantities of the particulate residues produced during the firing of a revolver using Black Powder propellant and a percussion cap primer. Samples of gunshot residue (GSR) were collected from the shooter’s hands, from surfaces to the side of the shooter, from surfaces near the muzzle of the weapon and from various locations on the weapon itself (both inside and outside). It was found to be relatively easy to identify PGSR from the hand of the shooter, from surfaces to the side of the weapon and from most locations on the weapon. However, using the methods of this study, no PGSR was identified within the large amount of Black Powder residue projected out the muzzle of the weapon and on the inside of its barrel. Reprint Information: Number of pages = 8. A study of the explosive output of rolls of paper toy caps, in variously sized assemblages, was conducted. The testing has shown that toy cap rolls are clearly capable of producing a powerful explosive effect if initiated with a sufficiently energetic event. TNT equivalencies based on toy cap composition mass ranged from approximately 10 to 80% for different sized configurations, with the largest equivalences being produced by the largest assemblages of toy caps tested. The results of this study are disturbing, considering that the toy caps (even in bulk packaging) have a UN classification of Explosive1.4S, which by definition should not produce significant blast or fireball effects when initiated. Thus perhaps it is appropriate to consider whether the UN test protocol is adequate for this product. Reprint Information: Number of pages = 8. Download for free pp 819-826. As is so often the case, this is an instance where one might take a useful lesson from someone else’s unfortunate experience. This article recounts a relatively minor incident experienced by a display company, but one that could have been of significantly greater consequence. The purpose of the article is to use this incident as the basis for discussing potential problems regarding mortar plug attachment and mortar recoil forces, which others in the industry may benefit from considering in greater detail. Reprint Information: Number of pages = 5. Download for free pp 827-831. In recent years, there have been at least three separate instances where white (or silver) comets, which were manufactured in China, have demonstrated a tendency to malfunction by powerfully exploding when they are fired. In each instance, the comets were solid masses of composition, as opposed to being crossettes or some other type of intentionally exploding comets. In studying these comets, even though there were three different types of comet devices under three different brand names, it was discovered that they shared some characteristics in common that understandably account for their explosive malfunctions. After providing a limited amount of background information, it is the purpose of this article to identify the problem characteristics and to recommend an easy and cost effective means for manufacturers to avoid similar malfunctions in the future. Reprint Information: Number of pages = 3. Download for free pp 832-834. There was a fatal accident not too long ago while a worker was preparing aerial shells for use in a firework display. What makes a discussion of this accident particularly relevant is that it involved: a) a smaller amount of pyrotechnic material than is often worked with at display companies, b) materials that were significantly less explosive than are often worked with at display companies, and c) a number of work practices that are somewhat common at many display companies. It is hoped that a discussion of this accident may help to identify some work practices and work facilities that should be considered for improvement from the standpoint of worker safety. One requirement for the construction of the safety shelter is that it be made using at least the equivalent of 3/4-inch plywood. While it might reasonably be concluded that some number of standard dimensional 2×4’s would also be used in the construction that is not specified in the NFPA code. One requirement for the placement of the safety shelter is that it be placed at least 2 feet per inch of mortar diameter away from mortars up to 6-inch in diameter and at least 4 feet per inch of mortar diameter away from mortars larger than 6-inch diameter. Quick-Fire clips are a product of Martinez Specialties and come in two varieties. One is the “VF” clip, which is primarily intended to couple to and ignite visco-like fuse products using an electric match. The other is the “LC” clip, which is primarily intended to ignite the lift charge of aerial shells using an electric match. (However, both clip types have other useful applications as well.) Supplies of both types of Quick-Fire clips were provided by Martinez Specialties for an evaluation of their effectiveness. This article is a brief report of those product evaluations. Reprint Information: Number of pages = 4. Download for free pp 843-846. A simple lilac flame composition consisting of 80% potassium nitrate and 20% shellac was investigated by emission spectroscopy and thermodynamic modeling. The flame from the burning composition had a reddish-pink core with a brighter pale lilac outer envelope. The core of the flame is presumably close to the equilibrium conditions predicted by thermodynamic modeling. The calculated equilibrium flame temperature is 1526 K; seven gases (CO, H2O, N2, CO2, H2, KOH, K) and one liquid (K2CO3) account for 99.7% of the molecules in the core of the flame. Of these, liquid potassium carbonate (mole fraction 9.6%) is expected to emit a continuous spectrum while atomic potassium (mole fraction 2.5%) imparts a red colour from the resonance doublet (766.491 and 769.897 nm), which is considerably broadened by self-absorption. The outer flame envelope is presumably a diffusion flame in which flammable gases from the core burn in entrained air. The maximum adiabatic temperature of such a flame was calculated as 1723 K; seven gases (N2, CO2, H2O, KOH, K, Ar, K2O2H2) account for 99.8% of the molecules in the outer flame envelope. The emission spectrum of atomic potassium superimposed on a continuous spectrum arising from the combining of atomic potassium with OH radicals to form gaseous KOH is responsible for the lilac colour of laboratory flames containing potassium and is the likely cause of the lilac colour of the outer regions of this pyrotechnic flame. The article includes a brief tutorial outline of some relevant aspects of the atomic spectroscopy of potassium. Reprint Information: Number of pages = 17. Download for free pp 847-862. It is generally recognized that spark particle size is one of the factors controlling how far sparks will be propelled from various firework items. However, there is relatively little quantitative information in the pyrotechnic literature documenting the distance sparks travel as a function of their initial size. This article reports on a brief study of maximum titanium spark particle travel distance as a function of the mesh size of sponge titanium included in two sizes of relatively small flash powder salutes. Before describing this work it should be mentioned that the purpose was not to find fault with the requirement of the National Fire Protection Association (NFPA) in its Code for the Display of Fireworks for a safety shelter on manned electrically fired displays on barges. Rather, it is to determine the level of protection actually provided by a shelter meeting the minimum NFPA requirement as it is most often applied, to share that information with the industry, and to offer suggestions to those that might wish a higher level of protection. Probably the most extreme test of NFPA’s required barge safety shelter construction is the direct impact of an aerial shell fired from the minimum distance allowed. To begin this investigation, last fall some initial testing was conducted and the results were reported. In summary, when a typical 3-inch shell was fired directly at the plywood (i.e., perpendicular to its front surface) from a distance of 8 feet, the 3-inch shell was found to be capable of penetrating ¾-inch AC exterior plywood backed with 2×4 dimensional lumber on 2-foot centers. Following this somewhat surprising result, thought was given to relatively easy and inexpensive ways that the shelter’s resistance to shell penetration might be improved. During further trials, it was eventually found that relatively simple and inexpensive modifications could be made that provided substantially improved penetration resistance, ranging to at least 6-inch shells. Descriptions of many of the trials and their results are presented below. An earlier article addressed the characteristics and methods for the use of Lightning Thermo-Tube™ (LTT). At about that time, some inexpensive plastic components that can be used to facilitate the coupling and branching of LTT were supplied for evaluation. This article reports on a brief study of the effectiveness and utility of those components. Reprint Information: Number of pages = 2. Download for free pp 870-871. Lightning Thermo Tube (LTT) is a recently introduced type of shock tube with characteristics that make it suitable for use with common pyrotechnics. LTT is reliably initiated by reasonably energetic electric matches and reliably ignites most pyrotechnic compositions. LTT is physically strong, easily spliced and branched, and is highly weather resistant. LTT produces a moderately bright flash of light upon functioning, which may be a useful effect in itself. This paper presents the results of a series of tests performed to determine some of the more important capabilities and characteristics of LTT as it relates to use with pyrotechnics in general and fireworks in particular. Reprint Information: Number of pages = 17. In the August 2006 issue of the National Geographic, S. Roth published a comparison of probabilities of Americans dying from various causes, based on 2003 data from the National Safety Council. The data provides some interesting information that helps to keep things in perspective when attempting to evaluate some of the risks associated with life. Reprint Information: Number of pages = 1. Download for free pp 886-886. This investigation was commissioned to evaluate a range of various aluminum metal powders for their potential use in compounding flash powders for use in powerfully exploding devices such as so-called M-80s and devices of similar construction. Reprint Information: Number of pages = 10. Download for free pp 887-895. Pyrotechnic reaction residue particle (PRRP) production, sampling and their basic analyses are similar to that for primer gunshot residue (PGSR). Both types of particles originate from energetic chemical reactions that generate products that are initially melted and/or vaporized. These chemical reaction products are dispersed by the temporary and permanent gases from the chemical reaction. Then the reaction products solidify and are deposited as tiny spheroidal particles on objects in the area. Sampling is accomplished using conductive carbon adhesive dots. Analysis is performed using scanning electron microscopy to locate potential PRRPs and energy dispersive X-ray spectroscopy is used to characterize the signature of each suspect particle’s constituent chemical elements. Often, standard micro-analytical chemistry performed on pyrotechnic residues cannot be expected to provide sufficient information for an investigation of the cause and course of an accident. On those occasions, PRRP analysis generally provides important information that is not otherwise available. For example, there are times when standard micro-analytical chemistry will fail to discriminate sufficiently between materials of pyrotechnic origin and other unrelated substances also present on the items being sampled. In addition, there are times when PRRP analysis can help identify details concerning the cause and course of events that are simply beyond the capability of micro-analytical chemistry. Early in 2008, the authors began a series of ballistics field trials to validate two computer models and, if the models proved to be valid, to use them to provide guidance to both firework display operators and AHJs when attempting to determine appropriate spectator separation distances for firework displays using off-vertical angled mortars and/or when launching displays from elevated sites. For these field trials, spherical shells were selected for three reasons; a) at present they are the most common type used in firework displays, b) the treatment of their aerodynamic properties is much simpler than for cylindrical shells, and c) their drag is typically lower than that for cylindrical shells and, as a result, their range is typically greater than that of cylindrical shells and therefore the results will be conservative. Reprint Information: Number of pages = 10. Download for free pp 907-916.